*When I use the word ‘Binge,’ I refer to the Caloric Intake of the empty energy beer brings. As my body absorbed 24 ounces of Canadian Water, overly processed Lemonade, I sat on my tattered blue bath mat under a steam shower. I closed my eyes, sprayed a few elegant moments of Lavender Oil, and let my recollection of what once was a morning ritual for me during a time of personal greatness. My high school alarm clock rings in my university dorm room. I wake up with a secret melancholy, but I’m ready to organize myself to be the distinguished student that I was becoming. First, I make my bed. Tie-dye sheets and matching comforter with an extra Wolf pillow design for back support during homework sessions and decoration. I complete my 10 minute session of 500 Crunches, Stretches, and Yoga. I prepare my instant Cappuccino in my Microfridge, as I look at my closet. No roommate to share space with. I quietly make my way to the girl’s wing bathroom. I can only hear one other student, must be a 8:00a.m Class. I wash my face thoroughly. Looking at myself with disgust. I turn on CNN, no volume, and put on my vice, Music. Bands like Cold, Incubus, or Chevelle would be on my a.m rotation. I plan my outfit carefully as I dress my face with make-up. I turn everything off, grab my bookbag, and head for the elevators. This is a process in itself. I live on the 10th Floor, and there are 18 Floors in my Dorm (that is now sadly defunct). I pass many faces I recognize, as I open myself to the World and shut down my depression. (Anorexia Nervosa Relapse. I fell down to 120 pounds. I’m 68.5 Inches Tall. Do the BMI Math on your own). I’m beginning to fall asleep as I hear my cat calling to me. I sit up, noticing cob webs in the upper right corner of the exiting door. I am angry at and with myself. I spent so much time being perfect, even when no one was looking. I am aware of the ED & Ritual thing, but I gave myself away for six semesters. Maybe, this is why now, I live among sporadic disasters in my duplex. The only ceremonies I practice today are stressing about my current Employment situation, Recycling, and taking care of my animals. Exhausted from alcohol and no time, I am ready to go back to sleep. (You should see my bed now. Sheets are ripped, bed unmade, and dog hair pollution). Just Maybe I was at my best then because I never drank during the week, I rarely ate, and I read over 1,000 pages of literature a week. Discipline as a memory is quite harrowing. August 25, 2003. 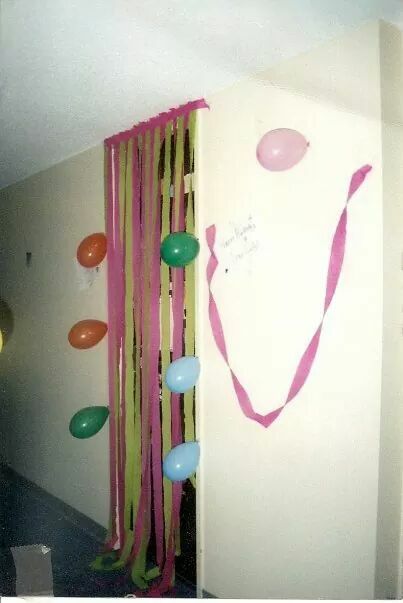 My Dorm Room Door decorated for my Twenty-Third Birthday, and my last Birthday as an Undergrad. By worldprosechronicles in Uncategorized on July 31, 2014 .